Ever since my first trip to Puerto Vallarta, Mexico, in 2001, I have been fascinated with Dia de los Muertos (Day of the Dead), and the art produced in honor of the holiday. I was fortunate during that trip as I stumbled across the work of the great Alfonso Castillo in a local art gallery on the Malacon. At the time, I had no idea who he was or how famous he was to become. I purchased two of his Day of the Dead-style mujares (women) clay candle holders and never looked back: I was hooked on Day of the Dead art and fascinated with the culture surrounding the holiday. It wasn't until a trip to the Los Angeles Museum of Natural History's "Mexican Folk Art" exhibition that I realized what treasures I had in my possession! Senor Alfonso Castillo exhibited his work at this show and I discovered he was one of Mexico's "Grand Masters". 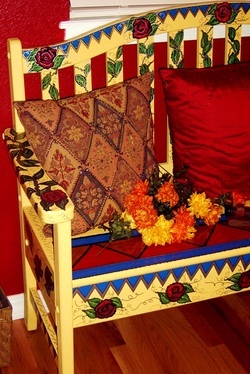 The wonderful Alfonso Castillo passed away in 2009, but his family continues his traditions by recreating his designs. I owe Senor Castillo a great debt as his work was the inspiration that sparked my own desire to create art in this genre. 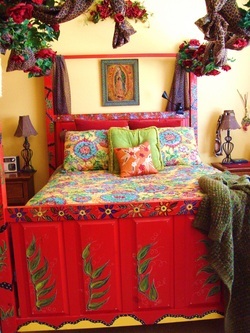 Two days after I returned from that trip to Puerto Vallarta, I painted my unfinished wood bed frame in "Mexican-style" designs and colors. To this day I continue to incorporate the themes, colors, and flavor of Day of the Dead into my own creations. Whatever the subject, whatever the medium, my paintbrushes end up being dipped in the brightest colors and my watercolor pencils, especially the purples, greens, reds, yellows, and blues, are constantly worn down to the nub with use. Human and non-corporeal beings find themselves transformed into skeletons on my canvas. I don't think they mind too much. If they do, they're keeping mum!